Il vostro trasferimento di arrivo privato dall'aeroporto di Chiang Mai all'hotel locale assicura un arrivo facile e senza problemi. Incontra l'autista dopo l'atterraggio e fatti strada nel comfort climatizzato del tuo veicolo privato per il tuo hotel prenotato. Nessuna attesa e nessuna preoccupazione con questo servizio di trasferimento disponibile 24 ore su 24, 7 giorni su 7! Il tuo autista professionista ti incontrerà all'aeroporto di Chiang Mai al tuo arrivo e ti trasporterà in un veicolo privato con aria condizionata fino alla destinazione scelta dall'hotel. Goditi un servizio rapido e personalizzato con questo trasferimento di arrivo all'aeroporto privato. Prepara i dettagli del volo e della sistemazione al momento della prenotazione. La conferma avviene immediatamente e viene fornito un voucher da presentare al tuo autista prima di partire per il tuo hotel. Il prezzo del viaggio è a persona, in base a da 3 a 6 adulti. Driver was on time and waiting for me with a sign. He was nice and polite. Van was clean and comfortable. Very prompt arrival of our cr to pick us up. The guide met us and spoke a very reasonable English and the car delivered us to our hotel. Very good. Having someone pick us up at the airport made the arrival process a breeze. The guide was there holding up a board with our names on it. The only glitch was they were not sure whether we were arriving at the domestic or international terminal. The guide sent the driver to the international terminal and the guide waited at the domestic terminal. I would suggest that for other travelers who might want to use this service to indicate which terminal they would be picked up. I did not think of this since this was our first trip to Chiang Mai. We were picked up in a big van which was very comfortable. I would recommend this service. Tian picked us up at the airport and did a great job hooking us up with a private all day tour. Coincidentally, she was also our guide that day and did a wonderful job showing us the highlights of Chiangmai. Her English is perfect and knowledge of her country impressive. We highly recommend the use of this company. It was the best tour during our two weeks in Thailand. Having never traveled to Chiang Mai before and not knowing what to expect, having your car ready and waiting is peace of mind. 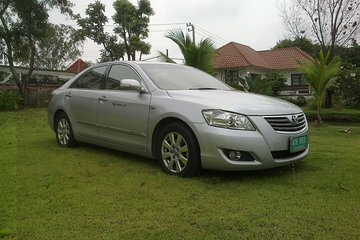 Very prompt and helpful throughout the transfer from the airport to our hotel in Chiang Mai! I would use this service again!